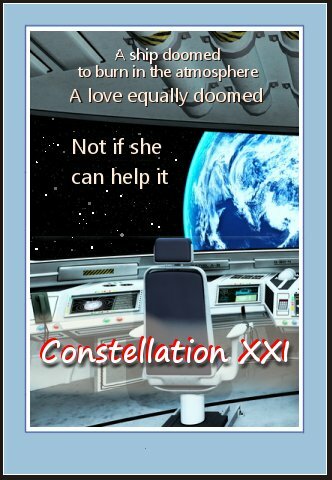 Once again, today’s snippet is from Ed’s Valentine’s Day sci fi romance, Constellation XXI. We’ve seen how her spaceship has mysteriously died, but this week we move back in time to the lead up to that terrifying moment. Sienna Dukelsky’s big day had finally arrived — her first solo flight. Excitement fizzed like champagne through her veins, but she ruthlessly popped every bubble. Spaceship captains did not giggle like schoolgirls. “Step thirty-eight of Monitoring Hyperspace for Incoming Ships Procedure,” she said in the forceful tone of a captain rather than her real voice. Her favorite apprenticeship instructor had cautioned her about speaking in a voice he said was too shy, too feminine, too darned nice. Crews won’t snap to attention and obey you, he’d said apologetically. No one reprimanded her now, or even answered. Sienna was alone on the DA387. Alone for the first time, on her maiden solo flight after five years as a flight cadet and three years as a tugship apprentice. Alone like few people had ever been. Alone like few people could tolerate without running mad. Effing Feline here again. I’ll give you a hint: Those last two words about running mad are foreshadowing. Some of you may remember that I create “travel posters” for each of my fictional worlds as part of my marketing campaign. Here’s the poster for this latest book! It really speaks to her training how she’s behaving exactly as she was taught when there’s no one around to hear or see her. A solo flight must be incredibly lonely and isolating. She a very, very by-the-book pilot . . . at least at the beginning of the novel. Man, just how many days was her flight supposed to take that the isolation was a problem? A couple weeks — but before the flight, she serves for six months on a small space station half-a-billion miles from her home world, in the Oort Cloud. Reciting the manual aloud sounds a bit crazy to me! As a long-time tech writer, I must take exception to this! Some of my manuals were things of poetry and beauty. Well, she was taught well. But yes, a solo flight, depending on how long, would definitely effect one’s mental health. She seems to be out to take over the world! Or at least her former lover’s spaceship. Her toughness is about to be tested. She does sound happy, maybe even a bit giddy. Interesting excerpt, love knowing more about the character! She’s been studying for years and years to be able to do this, so yes, she’s happy. Effing actually adds to the enjoyment, rather than being an irritant? Wow. Like this glimpse into her pre-Captain self. She’s very relatable. That’s what an author likes to hear, Alexis. Thanks! Acting the part also sounds like good psychology for herself, not just for anyone else who might be present. Having said that, that is one heck of a mouthful to recite for every step! And she has a slew of procedures memorized, too. I enjoyed how she ‘ruthlessly popped every bubble’. Great imagery. Nice to see you and ‘Effing’ cat again. She’s giddy but trying to be calm and strait-laced. As a definite introvert, I love “alone.” Where do I sign up for her job? I do hope all that training she’s been through will help her solve the “power’s out” situation she finds herself in. To get her job: 1) travel a thousand years into the future . . . or live a really long time. 2) qualify to enter an astrospace academy. 3) Spend five years studying. Alone is exactly how I like to be. Ah, but her aloneness is about to be invaded by her first love, the love of her life. Is that better yet? I like that reference to champagne. How appropriate–a ship’s maiden voyage! You always come up with good details. I’m afraid I can’t take credit, really. The whole champagne for a maiden voyage thing didn’t occur to me, but thanks. Although I’m afraid you may have made an enemy of Effing. I love the foreshadowing! Sounds ominous enough to make me want to come back for more. Running mad makes me think of The Shining, though I hope there are no axes in space! Glad to have you back, Effing! Nope, no axes. Nor is there any red rum. I’m sure Effing’s glad to see you, too, Cathy. She’s a perfectionist who’s trying very hard to be perfect. This makes me wonder how well she’s tolerating her solitude. So far so good, although the time is still young. Welcome back Effing Feline! I don’t think I’d be happy to be as alone as she is, but she seems ok. Yes, she thinks she doing just fine. She’s wrong, of course. I agree that spaceship captains should never giggle like schoolgirls. Unless they are anime schoolgirls who happen to be spaceship captains! I am also sympathetic to Effing Feline’s feelings on being upstaged by Twiggles the Dog. Thank you for visiting us at Naughty Netherworld Press! One thing’s for sure — none of the Star Trek captains ever giggled. It plays out with many thrills, chills, laughs, and tears.